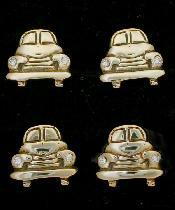 Gold and sterling silver Janes Reed designed cufflinks. Arrowhead 18K gold stud set. Arrowheads point the way to a wonderful night. 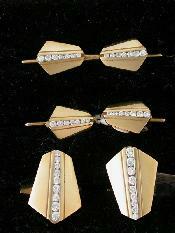 A true art deco set of dress studs. Cut the figure you know you can with this gold and turquoise set. The ultimate pairing of luxury and style. James designed this wonderful set for the true connoisseur. Nothing has the spectacular appeal of diamonds and gold. 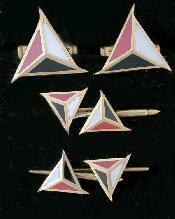 These cufflinks match the stud set below. 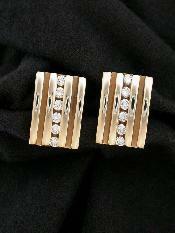 Wonderful solid gold and diamonds compliment each other gorgeously. Hand etched sterling silver, 14K gold and garnet stone cufflinks. James Reed works out of Santa Fe, New Mexico thus the inspiration for this piece. 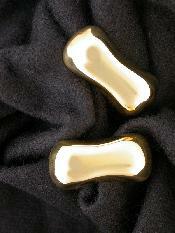 Solid gold cufflinks by James Reed. Classically shaped. Art deco diamond and 18K gold stud set. Elegance personified. A formal dress set, for the true sophisticate. Loosely shaped as arrowheads this gold, onyx, corral and pearl stud set will add that southwestern style to any formal occasion. True southwestern style and taste. 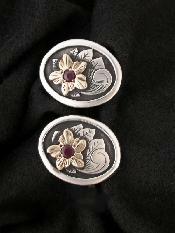 There is nothing like the color of corral; especially when mounted onto sterling silver. The striations that make malachite special are self evident here. When paired with 14K gold, stunning becomes the word; and the man who wears this set. Cats eye combination of 14K gold and oh so black onyx. This formal dress set exemplifies the strides we take at Falconhead to offer only the best. A vintage truck was used for inspiratrion on this pair. Wait a minute! Are the headlights what I think they are? You bet ya'; diamonds! Oh and the truck is handmade from solid 14K gold.